Found one file extension association related to BillMinder and 1 file format developed specifically for use with BillMinder. BillMinder is a personal bill manager and reminder for iOS devices iPhone and iPad. BillMinder simplifies your life by bringing all your bills into one manageable place. You will know at a glance which bills need your attention. You can also track your expenses with comprehensive charts and graphs. Create a BillMinder account and sync your bills so everyone in your household know which bills are due. Your data will be seamlessly backed up to our secure server so it can be recovered even if your device lost or stolen. Instantly see what bills are quickly approaching or past due. Visually see where your money is going and where you can save. You can email a PDF of each chart or even print them using AirPrint! 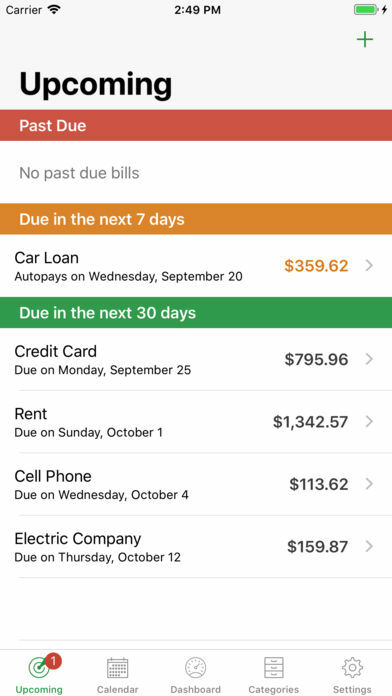 Be reminded when your bills are due without having to open the app. No internet connection needed! If you need more information please contact the developers of BillMinder (return7), or check out their product website.